This is the simplest of soups to make. Six minutes, that’s it. OK maybe seven or eight if you count the time it takes to boil water. Fried garlic, frozen peas, water or stock, cook, blend. It is yummy just as is, but go ahead and jazz it up however you please with extra garnishes. I did this one with mint and a spoonful of Botanical Lemon and Dill cream cheese. Crunchy fried onions are also nice for a contrast, a drop or two of liquid smoke is good, A lemony, garlicky, parsley laden gremolata works well against the sweetness of the peas. 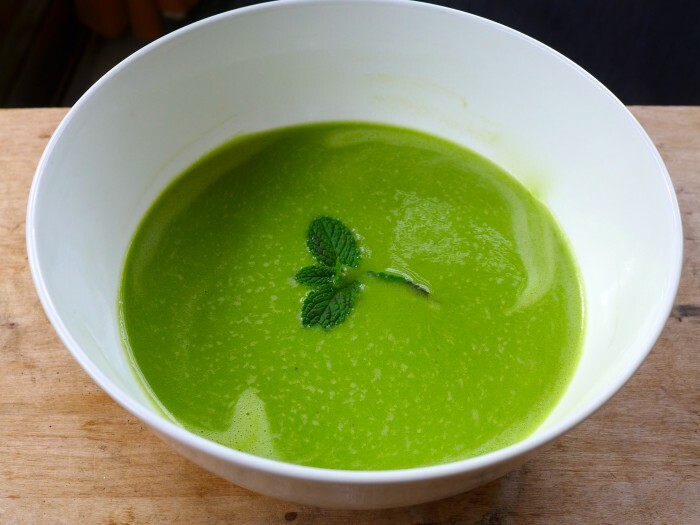 The point is it only takes 6 minutes to produce this beautiful green jewel of a soup. As close to instant gratification as you can get! Fry the garlic in the oil, taking care not to burn it. Add the peas and the liquid and bring to a boil. Cook for 3 or 4 minutes until just tender. Blend in a blender, food processor or with a stick blender. Eat as is or garnish with any favourite flavours. Love how it only takes 6 minutes! Looks good and nutritious. Perfect for the indolent cook!